Rereading the Fantastic Four comics from the start. I don’t dare suggest the legendary Jack Kirby ever phoned it in, but here, in his last few issues before his contentious departure from Marvel, it sadly kinda/sorta feels like he’s phoning it in. Case in point, the generic monster movie riff in issue #97. With the exposition out of the way, our heroes are attacked by giant sea monsters. One of the sea monsters is humanoid. There’s some lip service paid to the fact that it could be Namor or Triton, but probably isn’t. The mini-sub converts to a mini-plane and flies over the water’s surface, and Johnny flies to the beach under his own power. On the beach, Johnny is surrounded by swimsuit-clad ladies, in awe of his celebrity, but his mind is still on Crystal. He misses her after Medusa took away a few issues ago. He catches up with Sue and lil’ Franklin. Turns out the team was on vacation when Reed agreed to go monster hunting. They’re joined by Reed and Ben, while the humanoid monster watches from a distance. Here’s where things get a little confusing. The monster, a green, scaly guy, swims to an underground cave. Turns out he can talk, and he has a container with a strange liquid in it. He drinks the last vial and transforms into a human, exclaiming, “Once again, I am a breather of air!” He swims through another tunnel, where he ends up inside a Sea World-like water park, where he works as an animal handler. The FF is there, but just as tourists. The man, who still isn’t given a name, swims around with the dolphins, putting on a great show. Reed, however, suspects that this might be the same person who attacked them earlier. Reed stretches his hand into a water tank to investigate, so the man sends a whale to strike him. If it weren’t for his stretching power, Reed’s arm would’ve been crushed. 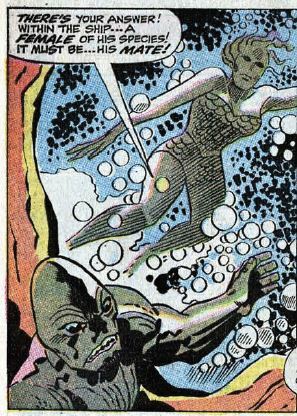 Reed approaches the man, who now doesn’t speak, and asks for a guide to the underwater caves in the area. Reed announces that man agrees to help, though I don’t know how Reed knows this, since the guy is just standing there. Back underwater, the mini-sub enters one of the larger caves. The stranger leads the sub into a deep bog, and then he escapes the sub by punching his way out of it. Reed tries to use a harpoon gun to escape, but there’s not enough air. 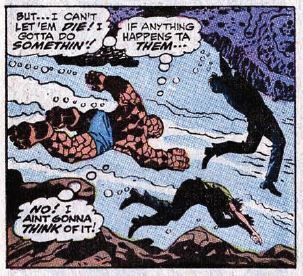 Ben grabs Reed and Johnny and swims them to an underground air pocket, thinking about how he doesn’t matter but that he’s not going to let his pals die. Now in an underground cave, with air, Ben confronts the monster. Then, fighting! The monster is strong and fast, a good match for Ben. Johnny and Reed recover from almost drowning and join the battle. The monster runs off deeper into the caves, and our heroes pursue. There, they find him with a strange craft that looks like a big piece of coral. 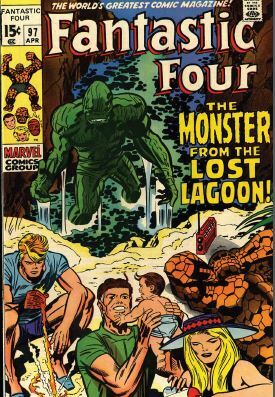 Reed, always the genius, immediately deduces that the monster is from another planet, one that is water-based. He’s carrying big globes of water into the ship, where he has a hot mermaid-type girlfriend inside. The monster coincidentally finishes his repairs at just that moment, and he takes off back to his homeworld. Just like that, the issue ends. Unstable molecule: He’s supposed be on vacation, but Reed just has to go fighting monsters. But, I guess that’s “fun” for him. Fade out: Sue sits this one out, staying at the beach with Franklin. 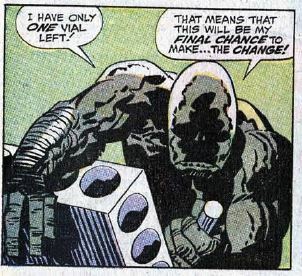 Clobberin’ time: Ben goes into “poor me” mode while rescuing his teammates, thinking “I’m just a crummy pimple on the acne of life.” Soul of a poet! 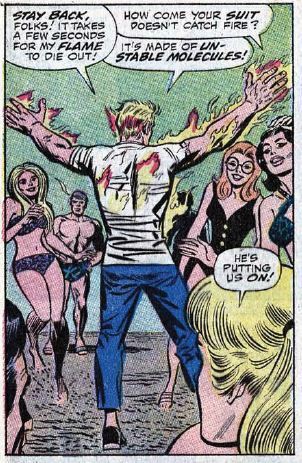 Flame on: Johnny’s so torn up over Crystal’s absence that he turns away a whole group of bathing beauties on the beach. He does stop long enough to remind them (and us) that his clothes don’t catch fire because they’re made of unstable molecules. Commercial break: What’s going on in this ad? Ordering raccoons, hawks, skunks, and wolves through the mail? Trivia time: The monster, who is never given a name, will be back in issue #124, where his personality/background gets expanded on a little more. Fantastic or frightful? A lot of this doesn’t make sense. Why does the monster speak when he’s alone, but not when around someone else? 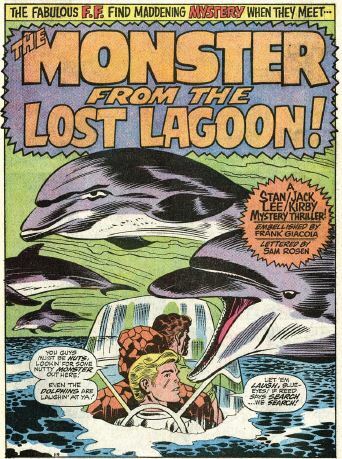 If the monster is an alien crash-landed on Earth, how the heck did he land a job at Sea World? And yes, this whole thing is totally riffing on Creature from the Black Lagoon and its sequels. Ben rescuing his teammates is a great moment, but other than that, there’s not much happening here.